High Times Magazine predicted the Marijuana industry will grow by 64% equating to $2 billion in 2014. By 2018, reporters predict it could be a $10 billion industry. With an exciting new industry emerging comes tons of jobs available for anyone interested in the field. From hands on work with the product to more administrative/back ended work to be done, anyone can be rest-assured that they can find work depending on their skills and expertise. 1. Dispensary Manager – Oversees day-to-day operations with staff, law enforcement, vendors and landlords. Primary responsibility is to coordinate and facilitate the transactions of the dispensary in addition to maintaining records, maintain contact with suppliers, embrace patient education and understand marketing. Training employees and deciding on which products to carry is also a function of the job. Keeping up with the changing local and state laws is crucial as well. 2. Budtender – Responsible for greeting patients, orienting them about strains and use, methods of delivery and dosage. Budtenders must know how each strain works to alleviate different illnesses. A good budtender maintains records of effectiveness of the strain for the patient and future reference. Each driver must be an agent of a dispensary. Drivers make home deliveries for patients who are infirm, homebound or anyone who doesn’t want to go to a dispensary. Qualities of a great drive include being kind and courteous and they like helping people. 4. Grower – Provides dispensaries with product. There are restrictions to how large a grow can be so check with the state/federal laws as well as other restrictions on the location. Growers are responsible for harvesting the best medicine. Training will be necessary to ensure a successful crop. A safe, secure location is also necessary for a grow’s success. 5. Trimmer – Responsible for manicuring and preparing the medicine. This entails cutting the buds off the branches and getting them ready to cure. 6. Cannabis Chef/Edibles Producer – For those who do not want to smoke, edibles are a great way to consume medicine. Chef/Producers are responsible for providing great tasting effective medicine. A chef should be a good cook and know the basics of the culinary arts. Since patients safety is number one, dosage and portions should be clearly labeled and easy to understand to prevent consuming too much or too little. Foods usually made with cannabis are brownies, chocolates and different types of candies. 7. Extraction Processor – This position requires considerable skills. A background in chemistry is very helpful. Concentrates are known for their high concentration which can have powerful effects that can be very valuable for patients. Products include hash oil, dabs and shatter, and others. 8. Glass Merchant – Even though this industry has been around for a while, those looking to sell products for medical marijuana is looking good. Products include pipes, bongs and even vaporizers. 9. Security – Dispensaries and even certain grow operations may need to hire guards to make sure the patients and employees are safe and to prevent robbery of products. 10. Marijuana Journalist – Writers and reports are needed to cover the industry. 11. Salespeople – Responsible for getting the product to consumers. This includes taking the medicine to different dispensaries. 12. Event Planners – Ever heard of HempCon and Cannabis Cup? Event planners play a crucial role in planning and executing events. 12. Reviewers – For some, this could be a dream job! With websites such as leafly detailing the different types of strains and effects, there is a need for strain reviewers! They are responsible for noting the experience(s) they’ve had so that patients can have a fairly accurate idea of what to expect. 13. Consulting – Have a skill that is valuable for new-coming in the industry? Consider using your knowledge and sharing with others. This could include getting someone’s business up and running, marketing products, and assisting business in growth. A great deal of hands on and “book” knowledge is required, but can be a lucrative position. 14. Administrative Functions – Marijuana companies need day-to-day tasks done just like every other company. Marketing, customer service, accounting and other services are also needed as well. A good website developer and IT technician will also be in need. Do any of these jobs interest you? 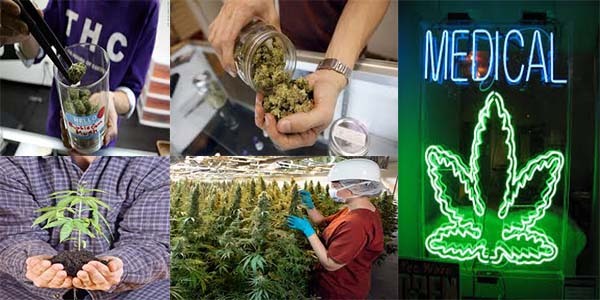 For job listings all across the US, check out www.cannajobs.com. To learn more about getting into the Canna-business, check out our seminars in your area.